Self Massage to Release Tension, Regain Mobility and Alleviate Pain! WHY? With repeated movements, certain muscles are constantly recruited, leading to muscle knots of contracted muscle fibers known as trigger points. Self myofascial release or trigger point pressure release involves applying and increasing pressure as the trigger point “releases” and mobility is restored. Tight muscles can start pulling over time, which can cause the muscles to work improperly, leading to injury. HOW? In order to target where the tension has formed, it is necessary to use a ball whose size, material and shape can withstand intense amounts of pressure. 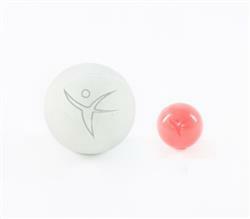 FLX Massage Balls consist of neoprene rubber and come in two different sizes and densities allowing for more of a targeted and effective approach to your rolling routine. Small Red Ball // The size and shape is ideal for the bottom of the foot concentrating on rolling from the metatarsal to the heel. Recommended for more intensity. Large Grey Ball // The size and softer density is ideal for the foot, calf and hamstring region allowing for one to apply more pressure and gravity to help with the release. Flexistretcher Massage Ball Foot Release from FLX NYC on Vimeo. Haven't tried the little one yet, but the big one works great for the back area.